Camille G. Caldera Collecting a group of friends and my Ouija Board — gifted to me years ago by an aunt — we assemble in a circle on the hardwood floor of the Co-op library. I’ve never been scared of ghosts. I’ve never stayed up staring at my closet door or the shadows cast across the ceiling, worried something was lurking. I always keep music on, and as a kid, I let audiobooks and the sounds of the city keep sonic watch over me. But the noise was to drown out my own thoughts, not voices of spirits. I didn’t feel as though the dead were connected to me or that I needed to communicate with them. Until now. Maybe it’s not a need, but a curiosity — a pull. I set out to make contact with the realm of the dead. I thought at first that I could serve as a vessel for someone I know to talk to their deceased loved one, but I don’t trust my interpretive abilities yet. With such an emotional subject at stake, I decided that a more removed look at mediumship was the way to go. One medium who has garnered lots of media attention is Tyler Henry, also known as The Hollywood Medium. There are seemingly infinite clips on the internet of famous and semi-famous people tearing up as he relays messages from their loved ones in the afterlife. His process seems clairvoyant — he often uses the language of sight, saying “the spirit is showing me…” Tyler claims that he receives information in the forms of all senses and then scribbles them down on a notepad in spouting, imagistic fragments onto which clients often latch. Many of these images point to true aspects of the client’s life, such as an image of Diana Ross, linked to the fact that RuPaul loved to sing The Supremes for his late mother. Yet I find it curious that he primarily works with celebrities, a demographic with easily accessible personal information and lots of liquid assets to spare on these readings. Maybe I’m being harsh. If his practice brings comfort and closure to people, can I really say it’s wrong? I decide to try reaching out to spirits through a seance of my own. I remember doing this a few times in high school: Once, in a friend’s backyard, a spirit that claimed to be a dead little girl spelled out my friend’s name. We all freaked out. Collecting a group of friends and my Ouija Board — gifted to me years ago by an aunt — we assemble in a circle on the hardwood floor of the Co-op library. It’s not quite the witching hour, but midnight approaches and the lights are dimmed. With our fingers light like feathers on the planchette, we wait as I ask for a sign of consciousness. The beginning is always slow. 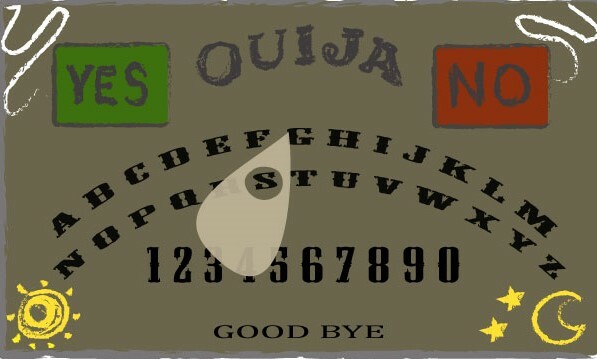 Eventually, the planchette moves more fluidly and with less hesitation. My inner skeptic wants to explain this with some group dynamic psychology — one friend takes subtle cues from another, like a glance toward one end of the board, a miniscule gesture of the index finger. These cues create a collective entity of communication, something we build together. Our fingers collectively slide to YES, to NO, to spell out answers. Eventually, we encounter a ghost who likely died in June of ’28 (we assumed 20th century). They identified themself only by initials, but apparently they lived in this house and were killed in a duel. This information seemed intriguing, but not personally relevant to anyone in the room and not as sensational as the Ouija Board Gone Wrong videos I’ve seen online. The conversation lagged after five minutes or so, and it felt rude to keep the spirit from whatever they were up to. So, we said “GOODBYE” via the word printed on the board. I look to Steve Huff, a YouTube medium, for another DIY approach to accessing this realm. He operates through a “soul speaker” that he combines with a spirit box. The box’s mechanism is rather nebulous to me. Often, a reversed voice is fed as an audio track into the device, and spirits speak by distorting this audio into regular, recognizable speech (with a good deal of reverberation and electronic clipping interspersed). Every now and then, Huff turns a knob on the box, which resembles something like an EKG machine built by WALL-E. I have no such device. But as many psychics have stressed to me, spiritual energy transcends space and time. So my experience of Huff’s seance through my computer screen is no less real than the seance in Salem that never got back to me about press passes. Or at least that’s what I can tell myself. Huff says he receives thousands of requests for seances, contacting famous people who have died like Lil Peep, Mac Miller, and XXXTENTACION. The latest popular request is Nipsey Hussle. In the video, Steve states his intentions, calls to the spirit by name and adjusts a dial on the soul speaker. Over the course of the 20-minute video, a few intelligible scraps of dialogue come through. I start to think these words are only sounding like real responses because they are captioned as such, and my brain is just filling in the gaps. I wonder how much of communication is just filling in gaps like these. In Huff’s seance with Lil Peep, he tries something different. After using the spirit box to hear some words from the departed, he invites his audience to focus on the spirit of Lil Peep so intensely that it is as if he were in the room with us. Huff says love is the key to opening yourself up to spirits. I slip into a meditative state and try to fill myself with love. If you do it right, you might feel an electric tingling or vibrating sensation on certain parts of your body. This means the spirit is reaching out through the veil and touching you. I feel some nerves sparkling on my arms and the vibration in my head that often comes when I try to tap into my spiritual self. It must be working. Obviously Lil Peep is not in my room in the flesh. I can’t see him or hear him outside of pictures and music. But like Huff says, energy is not created or destroyed. Could this energetic connection create a conduit for him to exist through us? Is that what we create through focused, channeled mental energy — vacant space for consciousness to spill into? Sitting in my room, with others whose minds are attuned to the same subject, I feel the presence of something that had receded before, in the quotidien jumble of our ego-to-ego social interactions. In erasing myself, I find room for a deeper connection to experiences that do not belong to me, people outside of myself. So where do all the electrical impulses of your mind go when your body betrays itself? Into the universe, which is you, says Huff. The meditative ritual of sitting with memories of a lost loved one, calling their spirit forward, and letting it exist across the span of many subjectivities is as close to resurrection as I can imagine. Perhaps this kind of conscious, selfless reflection brings us closer to the kind of existence that happens once our time on this plane is up. —Magazine writer Sophia M. Higgins can be reached at sophia.higgins@thecrimson.com. Follow her on Twitter at @LAVAGXRL666. This is the third installment of her column, Further Realms, which will explore rituals that uncover hidden worlds.